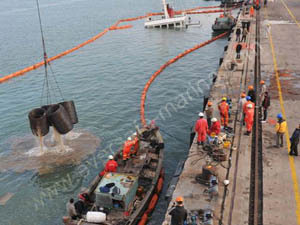 On January 10 one 95 meters cargo vessel named "Tianxiang 67" sunk when it was berthed to unload cargo at Fujian Quanzhou port. That vessel shipped 4900 tons steel bar from China Liaoning to Fujian Quanzhou. Water flushed into vessel through a 70 cm long and 20 cm wide crack in one of its holds. 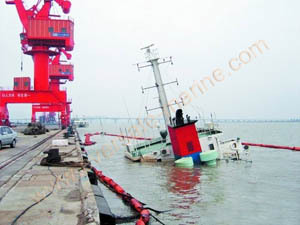 Vessel sunk until half of its operation room above the water. No shipman died due to in time salvage. The light weight of cargo vessel is 1600 tons and silt in vessel is estimated to be 600 tons. 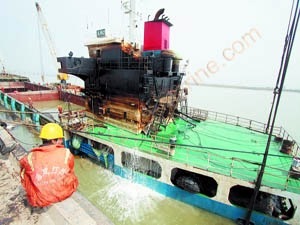 To refloat vessel cargo in vessel has to be removed first. Steel bars were bound underwater and hoisted out of water by a crane. It took 30 divers more than 10 days to clear the cargo. According to calculation when vessel’s eight ballast tanks are sealed they can offer 800 tons buoyancy. But there is only one 300 tons crane barge available so vessel needs at least 800 tons extra buoyancy to refloat. The salvage company decided to employ marine airbags to make up the buoyancy shortage. Marine airbags have some unique advantages in refloatation application: they can be easily placed in cargo holds to offer huge buoyancy and at the same time they drain water out which reduce vessel’s weight. Eversafe Marine was asked to provide airbags and technical service for airbag installation. Total 20 pieces marine airbags were transported to the locale,16 pieces were placed into vessel’s cargo holds and 4 pieces were attached to hull. The safety check of upper board had been performed before airbag installation in cargo holds. Steel ropes from the 300 tons crane barge bound the vessel to prevent it from possible capsizal during vessel refloation period. Then people began to inflate airbags slowly. When vessel’s main deck rose above the water divers sealed the crack of vessel and 18 pieces pumps drain water from vessel. After 5 hours hard working the vessel refloated totally. It was tugged to a Fujian shipyard for repair then. Comparing with rigid pontoon marine airbags can be transported and installed easily. Also airbags are more safe for salvage since they have bigger contact area with vessels. Generally speaking for less than 1000 tons buoyancy demand marine airbag is a good choice.